After a June and July of long working hours and the craziness that is the end of the school year, we were all very much in need of a break during August. 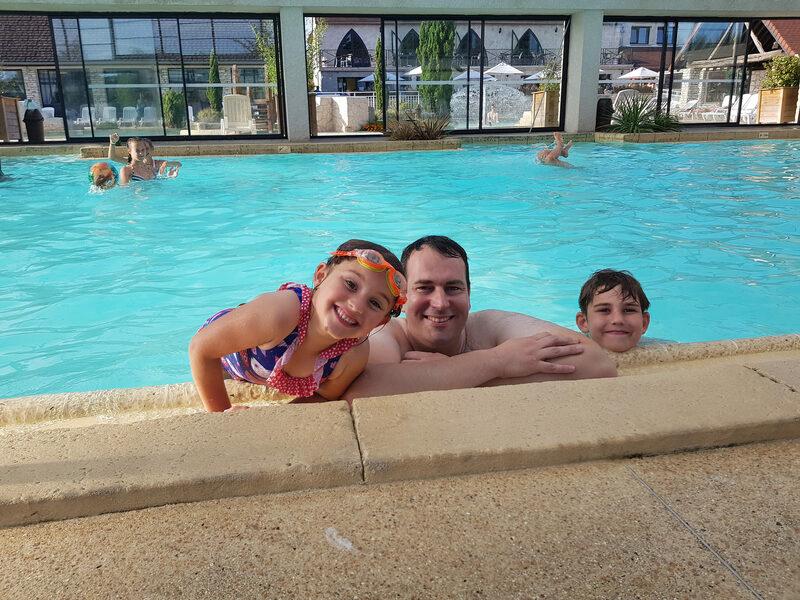 In an enormous stroke of luck, the contract I’d been working on drew to a close at the start of the month, and with my next one not starting until September, I had the luxury for the first time of a few weeks off with the kids without any work pressure. I hope I can pull that off again, because it was truly wonderful! Luckily Matt was also able to take a decent block of time off work. To make the most of it, we’d been planning a different kind of summer holiday for a while – a camping roadtrip around Europe! Matt spent his childhood holidays camping all over Europe with his family, but this really was my first experience of anything like that. Not being a huge fan of camping, we planned meticulously – both in terms of what we took with us and also where we stayed! I must admit, there were many times as the trip got closer where I wished we’d booked a nice villa somewhere in Italy where I could guarantee a comfy night’s sleep and a clean bathroom! But with our car packed full of gear to help make camping more comfortable (would highly recommend these Decathlon inflatable beds!) and some highly rated campsites in the sat nav, I felt genuinely excited about the break! 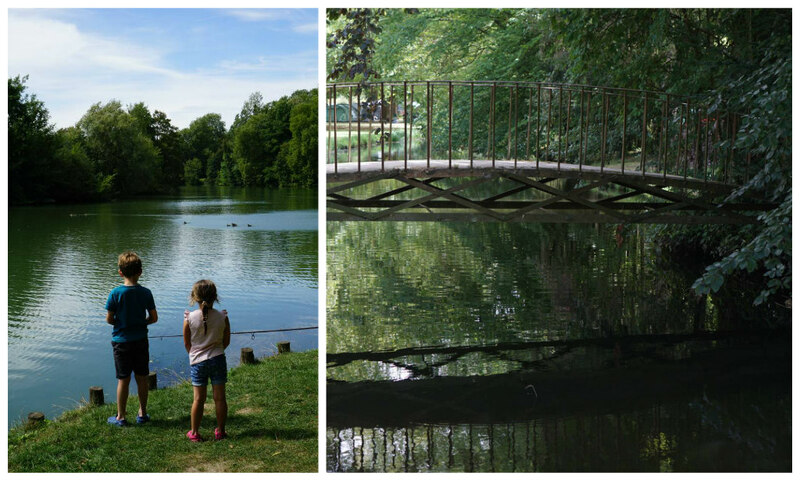 We’d planned to travel through France, Germany and Switzerland – spending chunks of time camping in the Black Forest, staying with friends near Zurich and exploring Lake Annecy. And at the last minute, we tacked on a weekend in Paris! We were careful to ensure that we weren’t constantly pitching and packing up the tent, so we chose three locations for camping, and then restricted the driving to a few long days between those. 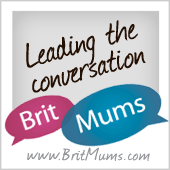 Here’s the route that we took – over 2,500km in just over 2 weeks! 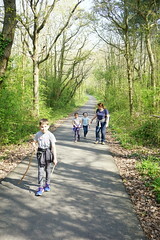 We broke the journey to Germany with a couple of nights camping in France just to the north-east of Paris. I’m so glad we did because by the time we travelled down to the eurotunnel, waited around for the train and started driving through France, we were all pretty tired. It was just a couple of hours from Calais to reach Domaine la Croix du Vieux Pont. We arrived late in the afternoon and were delighted to be taken to pitch our tent in a beautiful and peaceful corner of the enormous campsite. 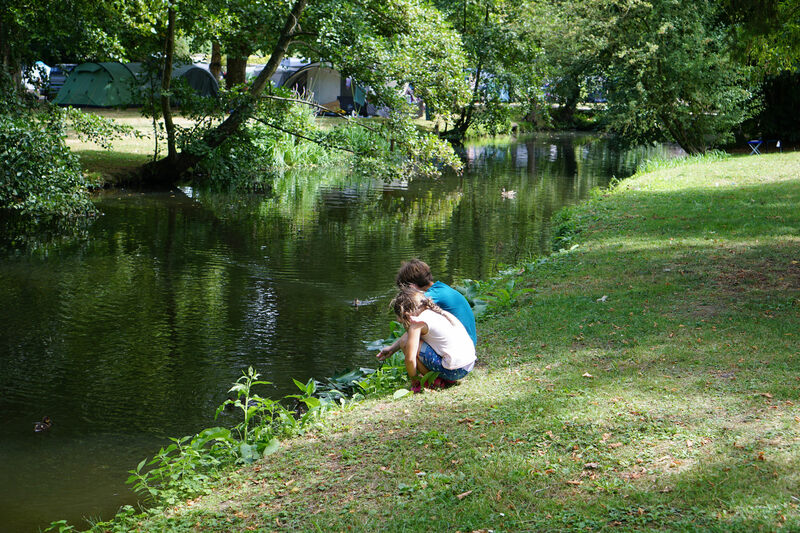 Much of the site is made up of cabins and permanent tents run by companies like Eurocamp, but those bringing their own tents were treated to natural camping fields away from the bustle. 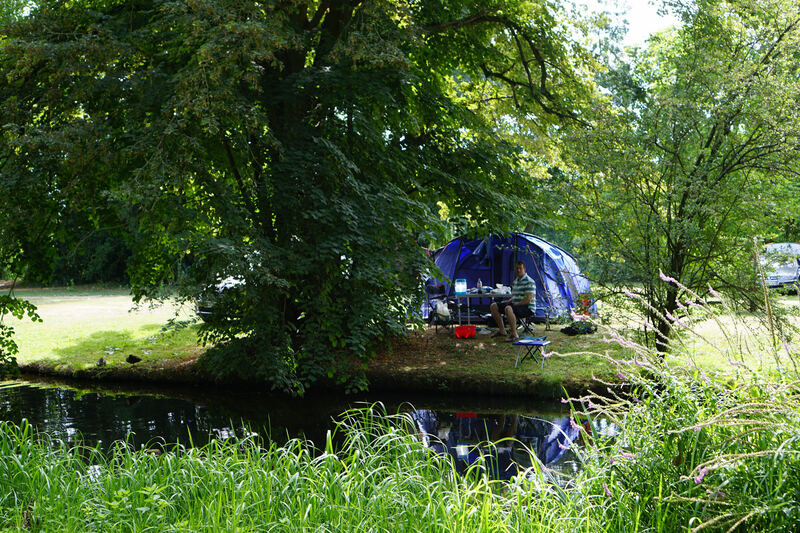 Our pitch was on a tiny island, accessible by little bridges and full of trees – just lovely! 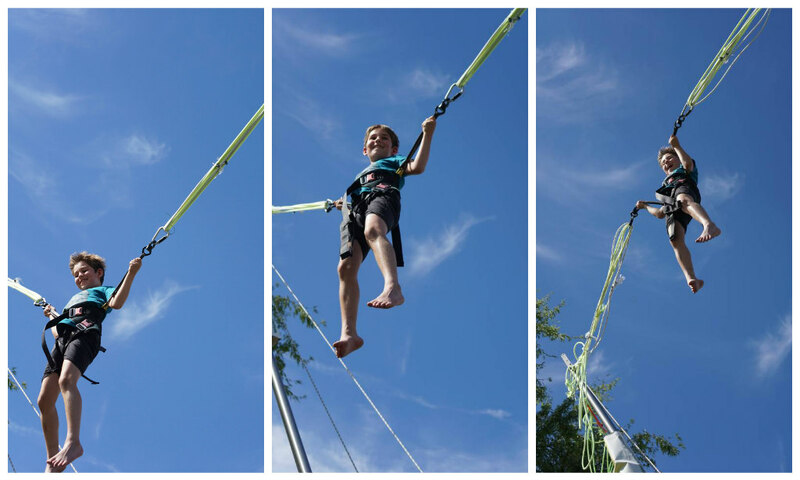 We pitched our tent as quickly as possible and hit the swimming pool complex for a quick splash before it closed. The children thought they were in heaven – there were several pools, slides, a lazy river and fountains. We’d chosen this site partly due to its ideal location as a stopover when driving south from the channel, but also because the facilities looked fabulous. We wanted to just relax during the first couple of days and not get in the car at all. 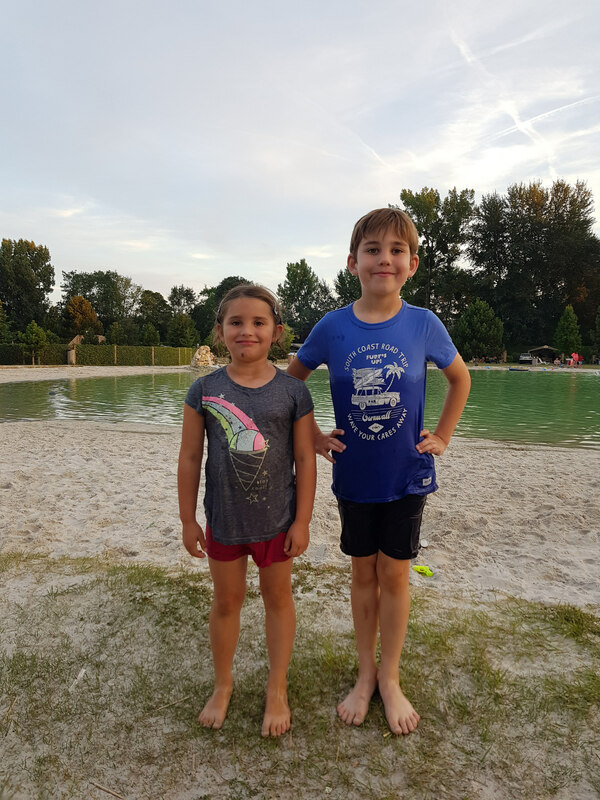 Camping La Croix du Vieux Pont was just perfect for us – there was so much to do on the site we barely scratched the surface! They were both freezing after this, so we headed back to our tent to get comfortable for our first night under canvas. The children passed out asleep pretty quickly, and after a relaxing evening reading and looking at the incredible stars, I had the best sleep I’ve ever had in a tent! A great start to our camping adventure! The next morning dawned bright and sunny, and we were quickly enjoying one of the real highlights of European camping – onsite bakeries! We sent the children off to purchase croissants and pain au chocolat while we brewed tea and relaxed. Fuelled by a pastry breakfast, they went off to explore our corner of the site. 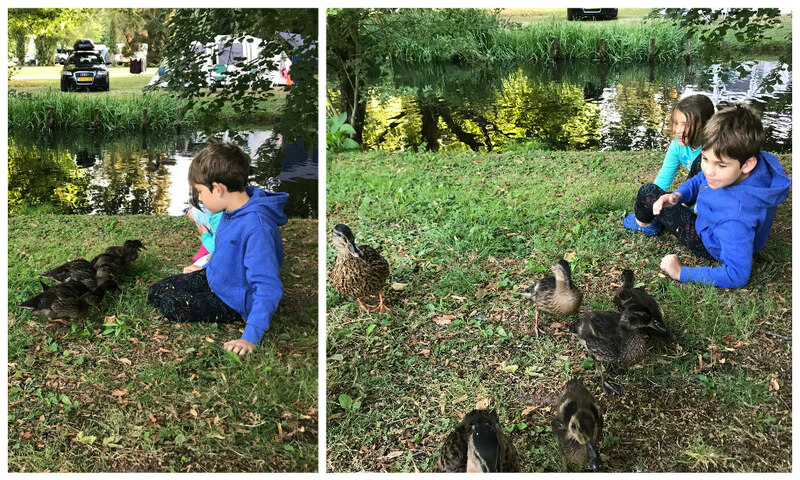 Before they were even dressed, they had a visit from a family of ducks! They found more little bridges from our island, and spent ages watching the big river and little streams that surrounded our pitch. There were plenty of other children about, from all across Europe, and Alex and Sophie immediately joined in playing with them – leaving Matt and I time to get on with our books! Heaven! We had a picnic lunch and then let the children choose our afternoon adventures. 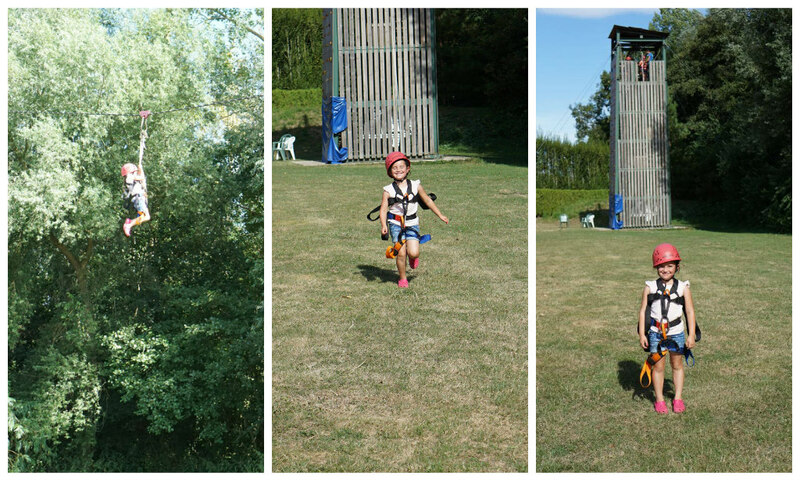 We were a bit disappointed when the top of their list of things to do was to try the campsite laser quest! 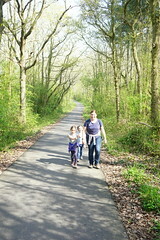 It was such a lovely day we didn’t really want to be stuck inside, but they were so keen we agreed to give it a go. So the four of us played a round of laser games and laughed so hard. Matt won, with Alex in a close second! Sophie and I were less good! The staff working there were excellent, and helped the kids go really high! 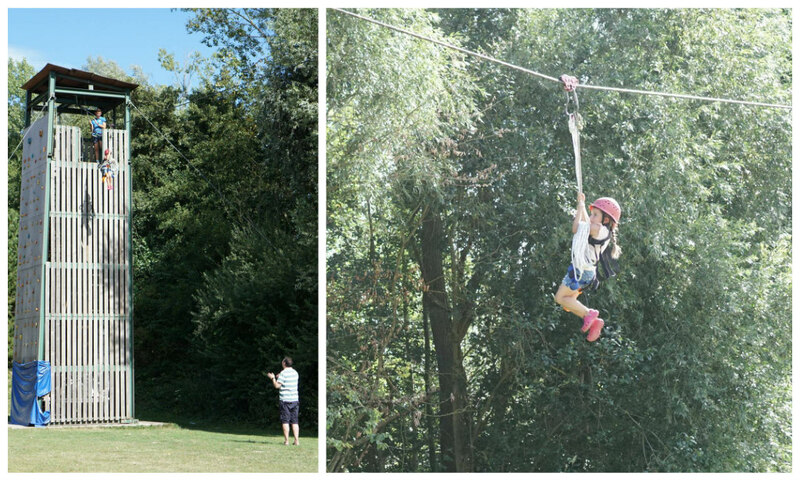 Sophie surprised us at the end of the day with a request to go on the giant zip wire! 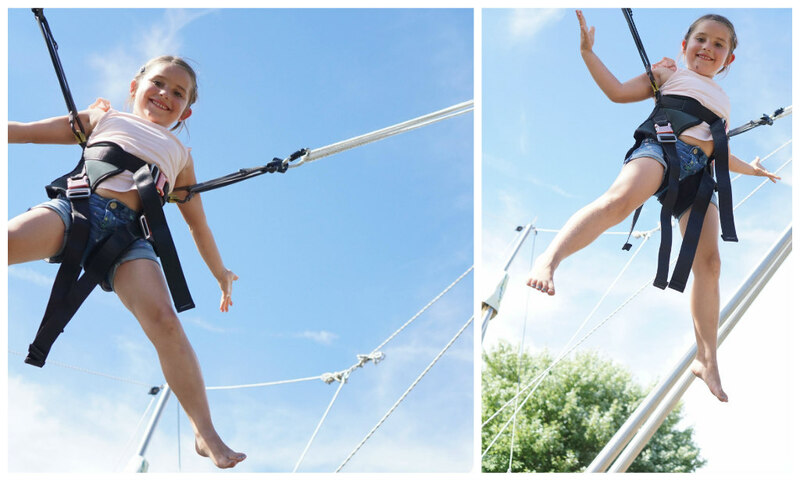 So up she went – about half the size of the other children having a go! 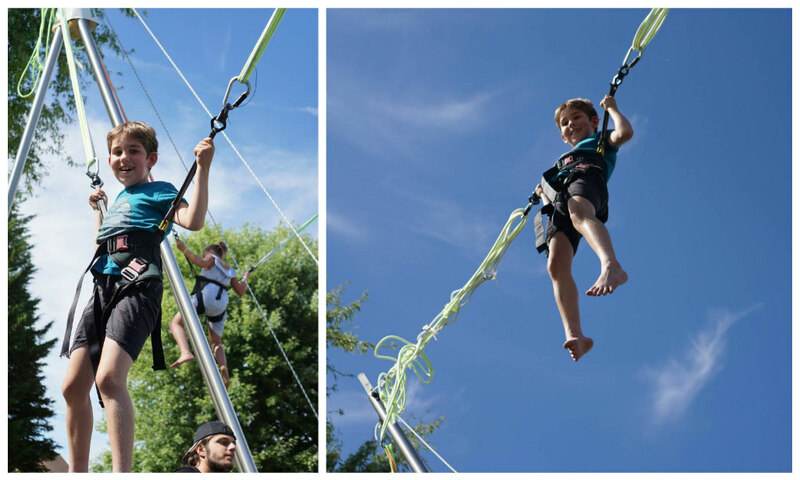 She was so brave and jumped right off the tall tower. 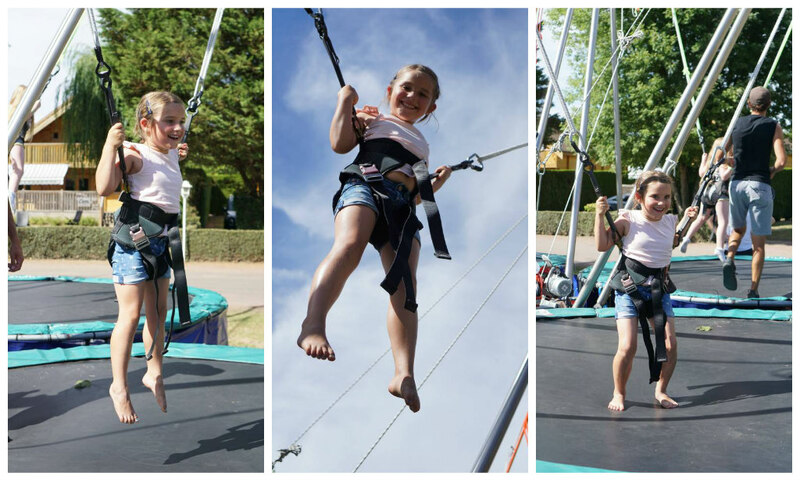 She listened so carefully to the staff and was able to lower herself down at the end – so full of smiles! We ended our day enjoying a vast and delicious meal in the campsite restaurant – complete with a candy floss dessert for the kids! Our final night at the site started well with my first ever sighting of a hedgehog which wandered past our tent. Around midnight the heavens opened and there was an enormous storm! The tent performed admirably and everyone else slept like a log, but I ended up listening to the rain and thunder for hours. It sounded very impressive under canvas! Thankfully it was dry the next morning when we packed everything up for the next stop in our summer adventure.